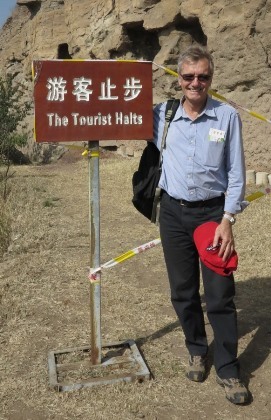 At the Yungang Caves in China in October 2013, the sign means ‘end of the trail, don’t go any further,’ but it translates very nicely. When Maureen and I arrived in Sydney the day after Christmas 1972, after a six month Asia overland trip from Europe, we had 27 cents left between us. In late 1973 we started Lonely Planet Publications to publish Across Asia on the Cheap, the story of our trip from London to Australia. We spent the following year travelling around South-East Asia and in early 1975 published our second book, South-East Asia on a Shoestring. From those early guidebooks Lonely Planet Publications grew to become the world’s largest independent guidebook publisher with offices in London and Oakland as well as the head office in Melbourne. In 2011 we completed the sale of Lonely Planet and although I no longer have any formal role with Lonely Planet I still seem to work with them fairly regularly! My new book – Tony Wheeler’s Dark Lands – is published by Lonely Planet. I also keep busy with Planet Wheeler, the foundation Maureen and I set up after we left Lonely Planet although our daughter Tashi spends more time on it than we do. Then there’s the Wheeler Centre for Books, Writing & Ideas in Melbourne, Australia with something on most days (and nights) of the week. We also have a publishing interest with Text Publishing in Australia, check our new best seller The Rosie Project. And I’m on the board of Global Heritage Fund, a wonderful organisation working to protect and develop archaeological sites in the developing world.